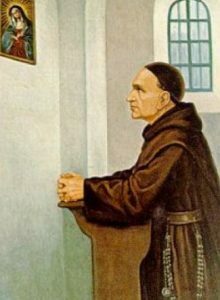 19 November is the feast day of our Carmelite brother St Raphael Kalinowski. He was born Joseph Kalinowski in Vilnius in what is now Lithuania in 1835, the second son of Andrew and Josepha Kalinowski (néePolonska), of noble Polish Catholic descent. From an early age Joseph felt called to the priesthood but first completed his education, specialising in mathematics, science and engineering. Opportunities for further education were limited so Joseph enrolled in the Russian Army so that he could attend a military college. He became a lieutenant in the Russian army, supervising engineering works including the railway between Kursk and Odessa. During this period he also worked as a catechist and opened a Sunday school. In the early 1860s he left the Russian army and supported the Polish insurrection. He was made the rebellion’s minister of war, accepting the post with the condition that he would never have to impose the death penalty. In June 1864 he was arrested and condemned to death. This sentence was commuted to ten years forced labour in Siberia. Few even survived the journey to Siberia – a forced march which took nine months – but Joseph was sustained by his faith and he was a source of spiritual support for his fellow prisoners. When released, he was sent into exile and went to Paris, where he worked as a tutor until entering the Discalced Carmelites in 1877 in Austria. He took the religious name Raphael of St Joseph and was ordained priest in 1882. His dream was to restore the Discalced Carmelites in Poland. He founded a community at Wadowice (later the home town of Pope St John Paul II) in 1889 where he worked alongside another saintly Carmelite, Blessed Alphonsus Mary Mazurek. He worked hard for church unity and was sought after as a spiritual director by both Catholic and Orthodox Christians. St Raphael died in 1907. He was beatified by Pope St John Paul II in Krakow in 1983 and canonised by the same Pope in Rome on 17 November 1991.